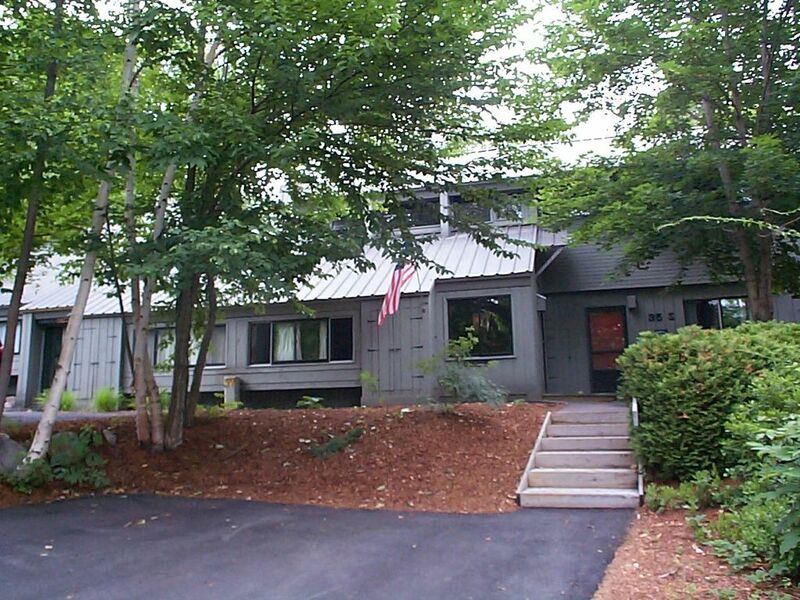 This Immaculate, clean and affordable townhome is a really nice place to enjoy the natural beauty of the White Mountains. This Village of Loon, comfortable, 4-level, 1600 square foot home has awesome views of the surrounding mountains. The 2 bath unit features an open living area, cathedral ceilings with fan, and an updated fully-equipped kitchen. The upstairs bedroom has a queen-size brass bed and the downstairs bedroom has a king-sized bed with a 22 inch flatscreen TV and it’s own private bath. The open loft with 2 twin beds and a bunk bed sleeps 4 comfortably, Has a separate entertainment center with TV DVD and VHS player. All bedding, towels and basic paper goods are provided. Relax in the living area in front of the fireplace and enjoy the 41” HD TV with cable and DVD player or CD player with suround sound. Open the sliding glass doors off of the dining area and enjoy the sound of the Clearbrook River below. Your stay includes membership to the VOL health club offering 4 pools,4 jacuzzis (1 outdoor), sauna,12 tennis courts, BBQ and game room. Credit card required. see photos of the Village of Loon: http://lvha.us/ The Lincoln/Woodstock area has a wide range of restaurants and taverns. There is ample shopping without all the traffic that is on the other side of the Kangamangus. There is a local theatre playing first run movies. There is nothing that you may want or need that is not nearby. My wife, Linda, and I enjoy the Lincoln area. We are 'snow sports' people and use our townhome every weekend in the Winter. I am an avid snowboarder and volunteer as a Loon Mountain Host. Since we visit our home only occasionally during the summer months, we are pleased to share our home with you during the summer. We live in Scituate, MA. Our original Ski house was in Bethlehem, NH. We expected to be Cannon Mountain in Franconia skiers. That changed when we discovered snowboarding and found that Loon Mountain had the best snowboarding. We would travel past exit 32 to exit 40 on Friday night only to travel back to Lincoln Saturday AM. Repeating the commute on Sunday. After a couple of years we moved to Lincoln. We spent a lot of time researching the various condo choices in the Lincoln/North Woodstock area and settled on the Village of Loon, we enjoy all the Village has to offer. Master Bedroom has a Private Bathroom with combination Tub/Shower and a separate sink/vanity. The Village of Loon MountainTownhouse Lodging Accommodations. Surrounded by New Hampshire’s famous White Mtns, The Village of Loon Mountain offers winter and summer recreation for the entire family. Across the street from Loon Mountain. 2 spaces in front of Home, more spaces available in overflow lot just below us. Has large u shapped couch. 42 inch flat screen in Living room, large TV in loft, 22 inch flat screen TV in Master bedroom. Both in Living room and Loft, VHS in Loft. Look inside closet in loft. Lots of toys in Loft. The home has 5 levels accessible by stairs. We have added a cell phone booster antenna that greatly improves reception. Your stay also includes membership in the Village Swim and Tennis Club, offering 2 outdoor pools, 2 indoor pools, 4 Jacuzzis (1 outdoors), sauna, exercise room, 12 tennis courts, outdoor BBQ and game room. During the ski season there is a free ski shuttle that stops every 10 minutes just below the home and drops you off at the Loon Mountain Base Lodges. Also near Waterville Valley, Cannon Mountain and Brenton Woods ski areas. Within an hour drive to Attitash and Cranmore Ski Areas. Jack-o-lantern, Owl's Nest, Maplewood, Sugar Hill and Bethlehem Golf Courses are within a half hour drive. Clean and comfortable with plenty of space for all. Stayed with my sister and 3 girls aged 10 - 15. The girls loved sharing the loft area and were wowed by the size of the condo. I had a couple of questions during our stay and Bob's response was immediate, helpful and super friendly! I've stayed in the Village before and always enjoy the pools/hot tubs/tennis courts as well as the central location. Discovered the Cascade Coffeehouse & Cafe in N Woodstock this time and HIGHLY recommend it for lunch! We had a wonderful weekend at the Highland Games. Your place was very clean and comfortable. Thank you so much! Hi Rod, So, life got in the way of the game of life! We like to provide games, books, puzzles, toys etc. just in case it rains. Glad you enjoyed your stay. We had a wonderful time at your condo. The living room is perfect for hanging out with the family. We were thrilled that the Loon channel shows the Flume video - watching that is one of our many family NH traditions! The option of indoor or outdoor pool was great to have. Thank you for letting us enjoy you incredible surroundings! thanks again for the smooth and uncomplicated rental. We had a great time at your place and in Lincoln! Nestled among the western slopes of the White Mountains, 2 hrs north of Boston, the Lincoln/Woodstock area is located right off Interstate 93 at exit 32. Our home is in the Village of Loon, across from Loon Mtn. Visitors will find a variety of indoor and outdoor activities, a unique selection of shopping at dozens of shops, superb dining, summer theater, movies, tours, sightseeing and challenging outdoor activities for adventurers seeking a more active trip. Take your pick of theme parks, water parks, antique and historical destinations, visit a recreational area and go swimming, fishing or boating. Visit quaint villages, Franconia Notch, Loon Mtn Resort, Cannon Mtn Tramway, Echo Lake, Pemigewasset River, Flume Gorge, Clarks Trading Post, Hobo Rail Rd, Hobo Hill Mini Golf, Lost River, Whales Tale Water Park, Santa’s Village, Story Land and White Mtn Motor Sports Park. Go Skiing and snowboarding, snowmobiling, mtn biking, mtn climbing, camping, horseback riding, golfing or kayaking. Credit Card charged securely thru our company "Maid Clean". Ask about Christmas and February Vacation periods. A cleaning fee of $120 is charged in addition to the rental cost and taxes. Three day minimum during Holiday Periods and Highland Games.